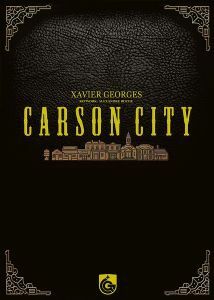 The year is 1858 in Carson City, Nevada. You have rounded up a team of courageous cowboys, and your plan is to buy up the best parcels of land in this new town, then build them up with the most prosperous ranches, mines, saloons, etc. 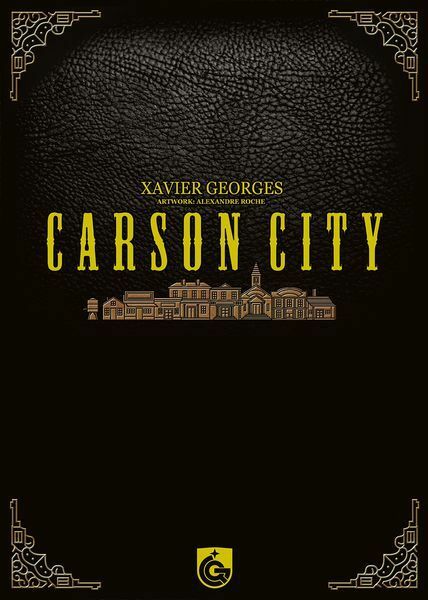 Carson City: Big Box is a collection of the Carson City base game, the Gold & Guns expansion, and the upcoming Horses & Heroes expansion. The game board has been redesigned and updated to support a sixth player and the Horses & Heroes expansion. The game is played in four rounds, and in each one of them, the players choose one of the characters, which give certain advantages. When several players claim the same action, a duel is fought, and the player with the most firepower wins the action. In the end, the most prominent citizen in Carson City — as measured by victory points that can be won both during and after the game — wins. Carson City: Gold & Guns, the first expansion, contains updated buildings and houses, new buildings, new double-sided characters, the "Indian" character (previously a promotional item at Spiel 2010), and a separate expansion called "The Outlaws". Carson City: Horses & Heroes, the second expansion, lets players visit the rodeo to claim additional victory points and use horses to unlock special actions. Three new characters are also added to the game.